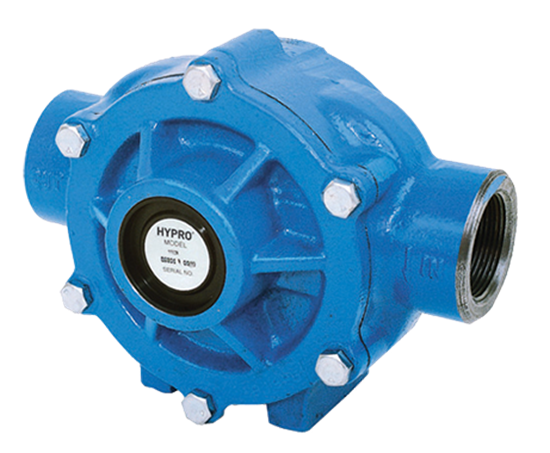 Hypro roller pumps are designed for agricultural and industrial spraying and transfer of a variety of fluids. These include insecticides, herbicides, emulsives, aromatic solvents, liquid fertilizers and many other liquids. The economical rotary-action roller principle requires no check valves while providing positive displacement characteristics with less friction and lower starting torque than other pumps. Construction features include a cast-iron body, 416 stainless steel shaft, sealed factory-lubricated ball bearings, cartridge-type lip seals of Buna-N, and versatile Super Rollers. (Super Rollers feature the life of polypropylene and the chemical resistance of nylon.) Rotation is clockwise. This 6 roller pump achieves up to 62.1 gpm (235 lpm) and 150 psi (10.3 bar).